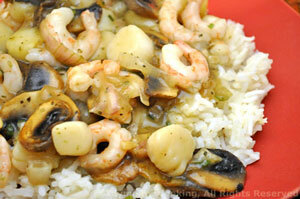 Shrimp and Scallop Newburg, Thyme for Cooking easy gourmet recipes. This should use the last of the tortillas, if not - make some chips! I've used dry-cured Greek olives in this dish; they will keep a long time in the fridge and we'll use them over the next weeks. If you have thick slices of Prosciutto, just trim a bit off for this. You could use all shrimp or all scallops for the Newburg, I like a mix. 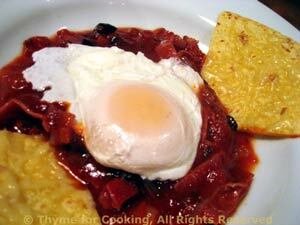 A different twist on Heuvos Ranchero, poached eggs on a Greek olive/ham/tomato sauce, with cheesy tortillas to dip. This is even easier with Faux Poached eggs - and old restaurant trick. The sauce: Roughly chop shallot, Prosciutto and olives. Heat oil in a small saucepan. Add shallots and Prosciutto and sauté until starting to brown. Add olives, tomato sauce, basil, reduce heat and simmer, uncovered for 10 minutes. Sauce should thicken. The tortillas: In nonstick skillet, large enough to hold the tortilla, fry the tortilla, without oil, until light brown. 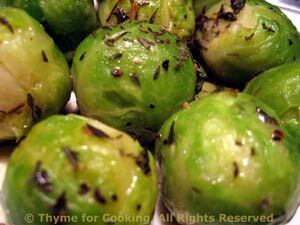 Turn and fry other side. Sprinkle with cheese and cover until the cheese melts. Remove tortilla to a plate and cover with the lid to keep warm. The eggs - the easy way: Heat oil in medium skillet over medium heat. Add eggs and fry until whites just start to set. Add 1/4 cup of water, cover and steam until yolk starts to turn white, 1 - 1 1/2 minutes. The proper way: Fill a large skillet with water. The water should be 1 1/2 - 2 inches deep. Heat water over medium-high heat. When water is softly boiling poach eggs: one at a time break egg into a small saucer. Swirl a spoon in the water where you will put the egg - off to one side. When water is swirling drop egg into center. With slotted spoon try to keep the white together. Do next egg. With regular spoon scoop some hot water over tops of eggs. Poach for 4 minutes or until white is set but yolk is still very soft. Remove eggs with a slotted spoon. To finish: Divide the sauce between two soup plates/flattish bowls. Place an egg on top; cut the tortilla into wedges and add to bowls. Serve.